Hey, everyone. 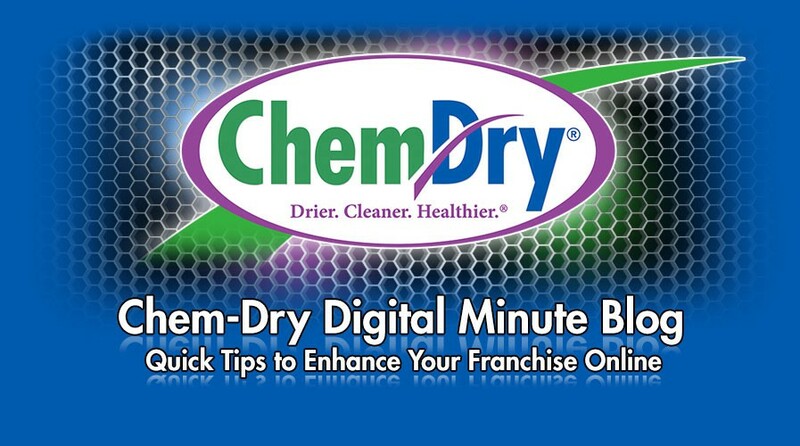 Welcome to the Chem-Dry Franchise Owners’ Weekly Digital Minute blog. My name is Scott Ostermiller and I’m your Digital Marketing Business Development coach. I’ll be posting here on a (nearly) weekly basis to give you news and tips on everything you need to know about marketing your carpet cleaning franchise online. To give you a little background on me, I hold a Bachelor’s degree in Business Management and Chinese from Brigham Young University – Idaho, and an MBA from Utah State University, with an emphasis in Marketing. My career has been spent working for both large companies and startups. Prior to joining the Chem-Dry team, I spent two years working as an Email Marketing Manager for the largest fitness equipment manufacturer in the world. I am Google AdWords certified, and well-versed in most other aspects of online marketing. From Pay-Per-Click and Search Engine Optimization to Facebook and YouTube, I have the skills and assets you need to grow your business through marketing. PS On a personal note, I have a quirky hobby – wet shaving (or what people 75-100 years ago just called “shaving”). I even have a YouTube channel devoted to it. You can check it out here.